Loyola (Loey) Colebeck is professionally accredited through SEDIBAC (Catalonia Society for the Study and Diffusion of Dr. Bach's Therapy) #402. 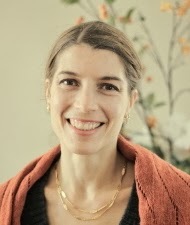 She is the translator of Pablo Noriega's book, Bach Flower Essences and Chinese Medicine, and is an approved PDA provider for NCCAOM. Loey has lectured at the fourth and sixth biennial SEDIBAC/SEFLOR Flower Essence Therapy conferences in Barcelona, Spain, in 2013 and 2017. She has taught classes at various institutions including Northwestern Health Sciences University, St. Catherine's University, and North Country Herbalist Guild. Loey's mastery-level coursework at several schools in Barcelona include Psychotherapy Tools for Flower Essence Therapists, Chinese Medicine and Daoist Sexuality, and Family Constellations. She has studied at ISMET (Superior Institute of Traditional Medicine), Anthemon Institute, SEDIBAC, and Aula Bach. Since 2015, Loey has been practicing Constellations of the Intention (IoPT) for transgenerational and early childhood bonding trauma. In 2017 she began enriching her self-taught Jade Egg practice with qigong master Kim Sierra Robinson of The Jade Door. Also in 2017, she was ordained by the Homeopathy Congress and enjoys officiating weddings as part of her ministry. Loey has extensive university training in dance, is certified in Reiki, and received her Bachelor's degree from the University of Wisconsin in 1996. Loey provided feminine embodiment workshops to women for nine years in Spain, offering integrative healing sessions to women working through issues related to sensuality, sexuality, trauma, loss, maternity, and feminine identity. She provided indoor and outdoor movement/therapy sessions on the forested grounds of her Spanish mountain home, and collaborated with various groups around Spain. Loey has helped hundreds of women open the door to their own deep well of sensual, embodied wisdom. The "Spanish mountain years" was a period of deep enrichment, research and growth for which she is eternally grateful. Currently in Minnesota, Loey enjoys art exhibits, good dance floors, gardening in community, wilderness adventures, fashion, and cozy time with friends and family.